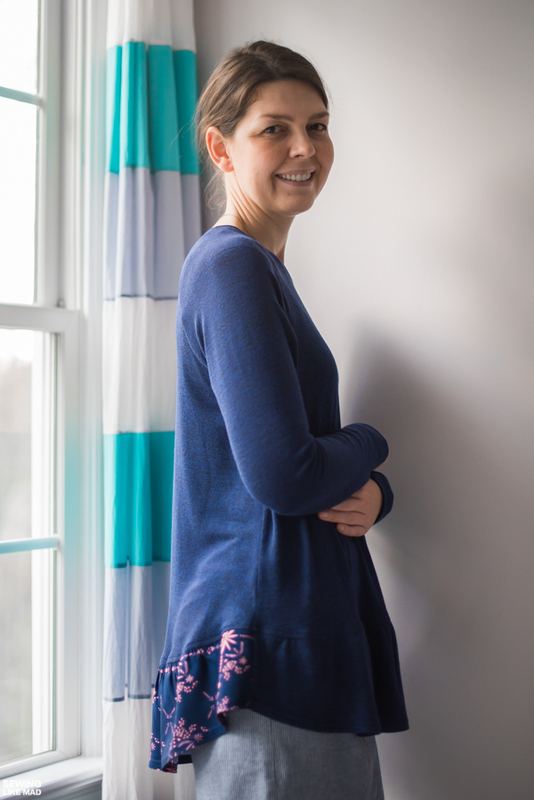 Sewing Like Mad: Waterfall Raglan - Make it Mine Waterfall Tour. Waterfall Raglan - Make it Mine Waterfall Tour. I happened to finish my Waterfall Raglan AND love it so much that I jumped on the Chalk and Notch's Make it Mine Waterfall tour bus, he. 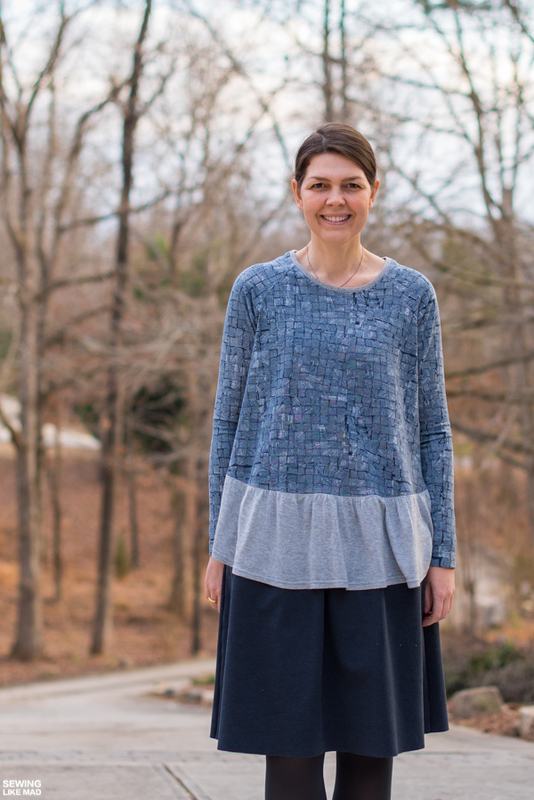 The Waterfall Raglan is a wonderful and versatile style. 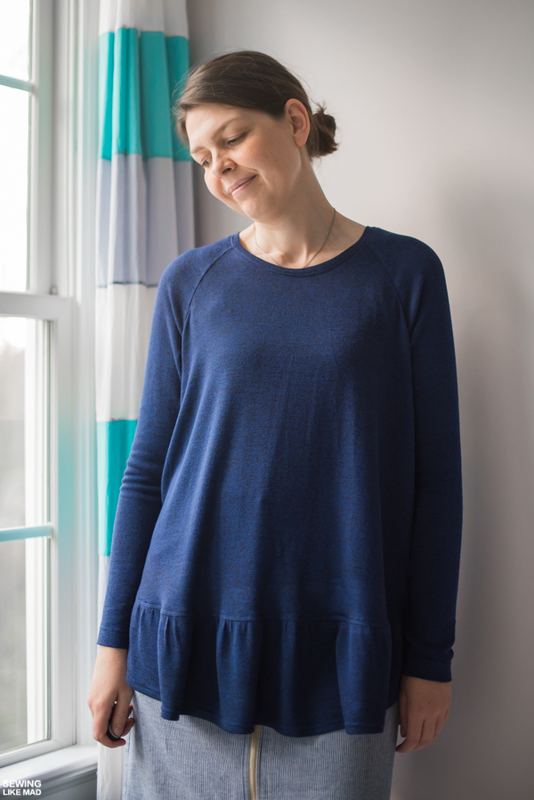 A raglan tee or dress with some width/swing and an added moderate ruffle at the hem. It has a bit of a curve at the side which adds a great effect. Gabriela originally designed it for kids but all the mommies were rather jealous and she has been so kind to release it for women too, yay! I have made two tops for you today. It's funny because I think this one above has the best photos but it's the other top (below) that I think has the best result. It's of course all about drape. This one above is made of lightweight cotton sweater knit and it is peeeerfect for this style. The surprise back ruffle is rayon which also has great drape. 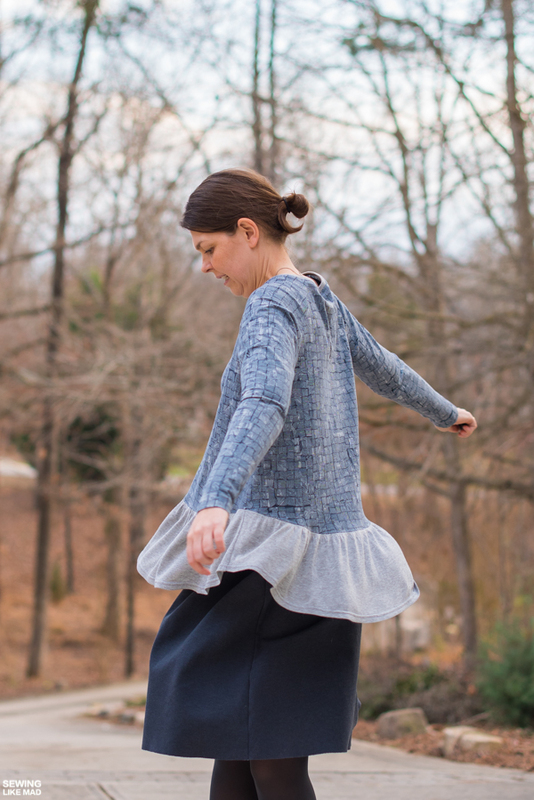 The top is designed for knit fabrics but you can always make the ruffles in drapey woven fabrics. No problems there. The printed knit fabric I used for the bodice is just a tiny tiny bit too thick for this project I think. We are talking details here, I will totally use this too for sure. But the tee doesn't drape as nicely as the other one and does give a bit of a pregnancy effect, hehe. 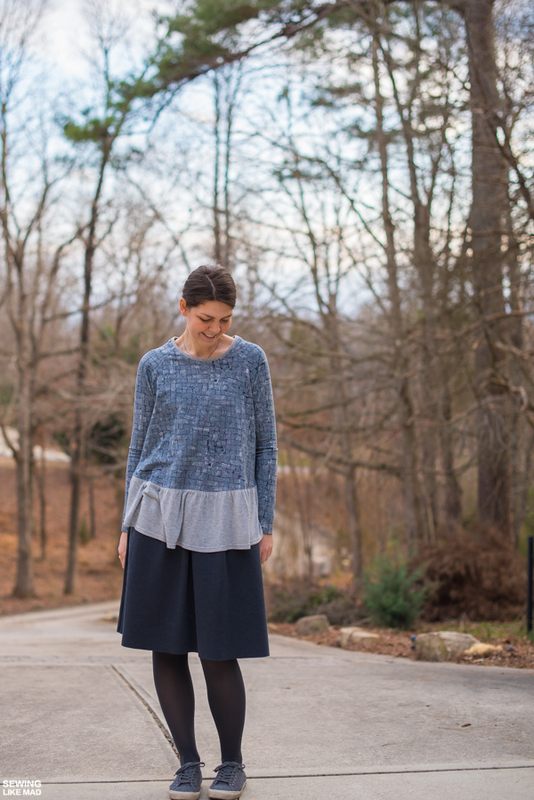 The printed knit is from Art Gallery and the ruffle is made with thin cotton sweater knit. 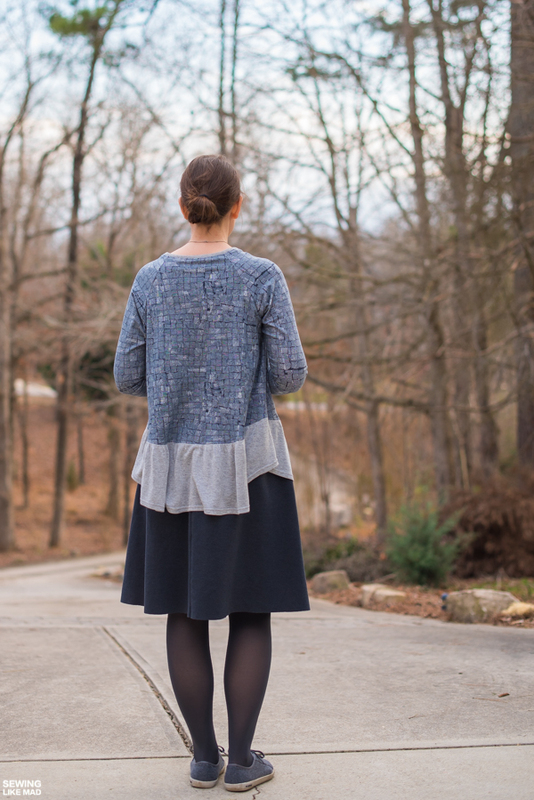 I'm pretty sure both sweater knits in this post is from Fabric.com. I bought the Art Gallery knit at Imagine Gnats awhile back on sale. The pattern is, as always with Chalk and Notch Patterns, perfection. I really have absolutely nothing else to say than BRAVO!! This style has slim arms so I loved that Gabriela included both biceps measurements and finished product bicep/sleeve measurements. I ended up making a size 6 with a size 8 bicep sleeve width. With this fabric, which is stretchy but doesn't have endless stretch, I probably should have made a size 8 overall. It's a bit tight over my shoulders and make the neckline 'pop up' a bit. I did pull it down on most photos but you might see it on some? The navy one in sweater knit (which is way looser) does not do it at all even though it is exactly same size. So if you have wide shoulders like me and using a firm fabric then size up. I added 3 cm length to the sleeves. Again I'm tall and I have long arms so that is pretty much standard procedure for me. It was a cold day and the ruffle kept sticking to my skirt, ha. Darn you, static electricity! Not good for blog post photo shoots! 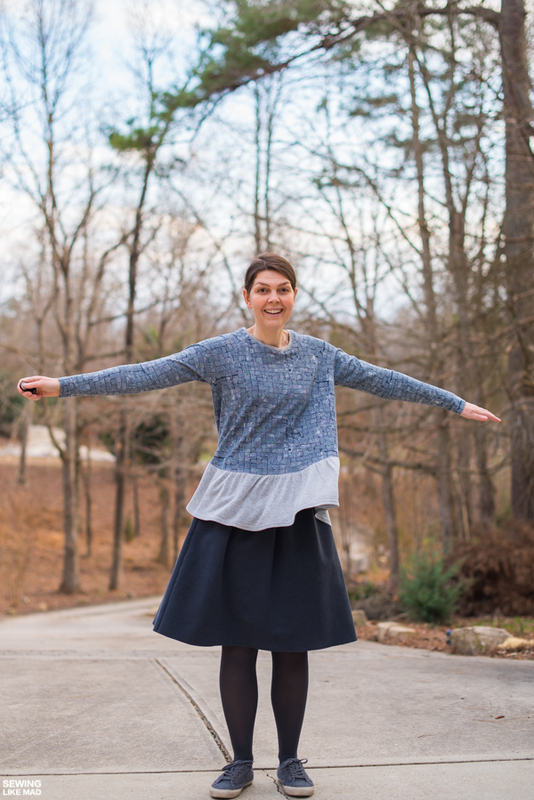 I just had to get some twirling photos! Told you I have long arms! I seriously love this one. 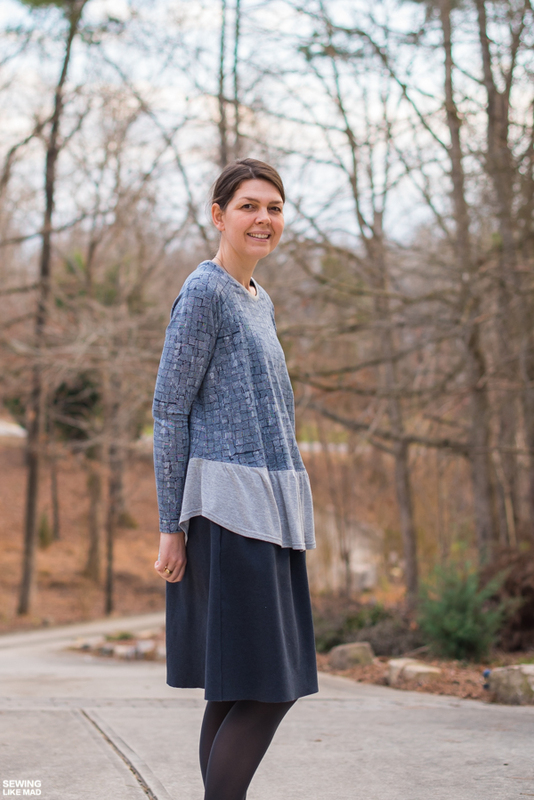 And I couldn't help myself when I noticed how well that Cotton & Steel rayon challis matched this navy/black heathered sweater knit. And I thought just adding it to the back ruffle would be a subtle but fun detail. From the front it is just a very very wearable top. I love the slightly longer back. 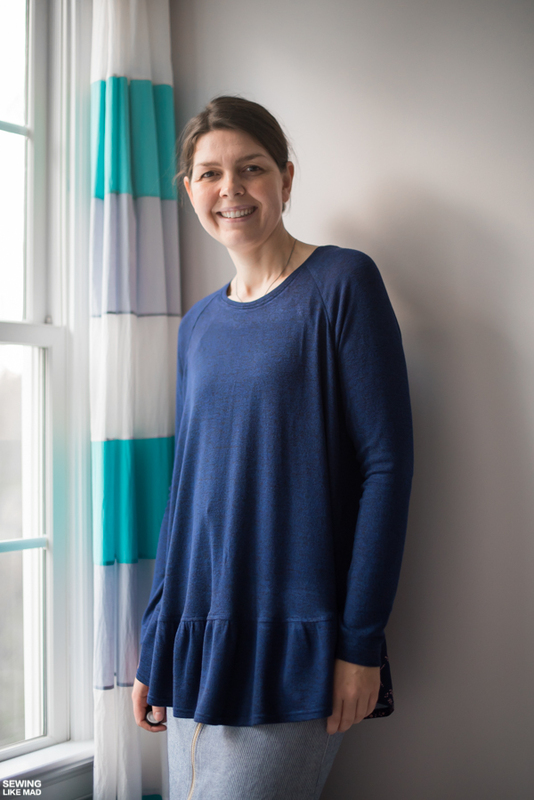 Don't forget to link up your own Waterfall Raglan to the link party HERE and get a chance to win a gift card to Stylish Fabrics. Get your own Waterfall Raglan HERE. Also don't forget to visit all the other fabulous ladies that are going to post today for the Make it Mine Tour. Today is day time looks, tomorrow is night/party looks and Friday is pattern hacks. So fun! Very pretty! It's interesting to see the difference the fabric makes! Lovely, both of them! The back ruffle detail on the second one is beautiful. So simple and yet it really adds interest! Both tops are very pretty! In the outside pictures you look like you stepped out of one of the Japanese pattern books. :) You can totally pull that look off! It's always fun to see how much fabric matters to the overall fit. Beautiful as always! Ohh Mie! This post is just so good! I love both tops on you (and your photos are gorgeous!). And you totally do NOT look pregnant! Also I am always amazed by how great you are with the details. 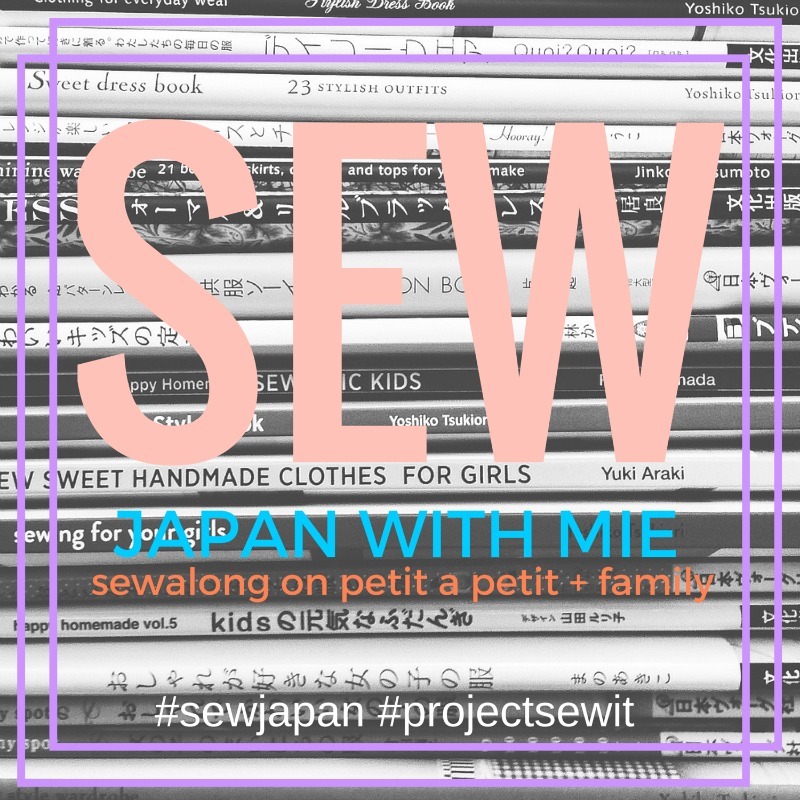 Your sewing is always impeccable! Of course I love both looks so much! I made one of my test ones from the exact same Art Gallery knit and had the same neckline issue (and totally assumed it was me messing up somewhere along the line, so I have been pulling mine down when wearing it too, haha). Now I know what to do! That second top is absolutely gorgeous too!! That secret surprise back ruffle is genius! OMG! I love the colour block of the rayon at the back ruffle! Genius! The back ruffle is aahhhhhh----mazing. Such amazing crisp pictures!! I love them! 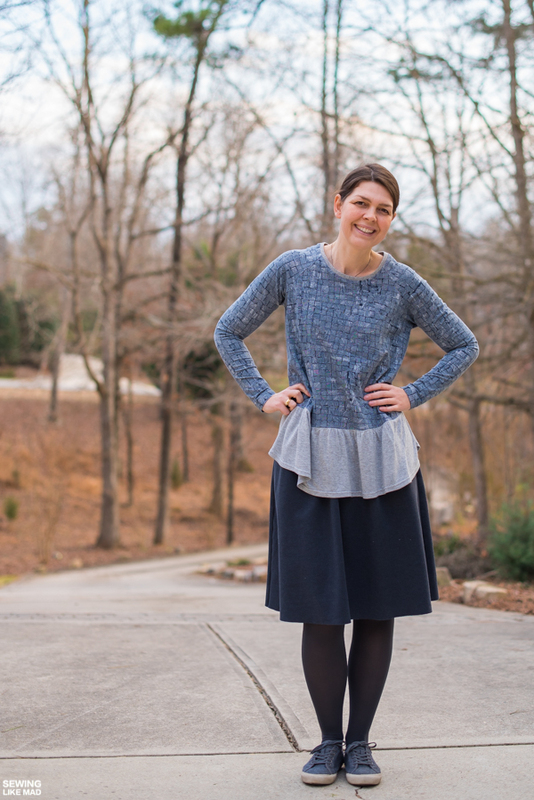 Both fabulous tops but i simply love the navy waterfall with the rayon challis ruffle! I love the little party in the back of the navy version! 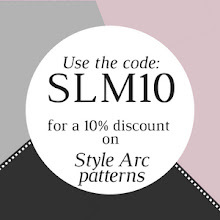 I love how you can make each pattern your own. Amelia Earhart Costume with Conifer Jacket.